Make an Earth day craft or invention and teach Kindergarten students about reusing materials at the same time! Any material to reuse instead of waste. Some examples are, scrap paper, wood scrap, branches, old cloth, discarded magazines, broken crayons, cardboard boxes, empty containers (milk containers, food and beverage containers). Use items that are available within the school or ask for parental involvement. Give students examples of inventors. Talk about the vocabulary word, invention (a device created after study or discovery) and chart the meaning. Make a list of inventors and their inventions. You can find information here. A couple of my personal favorites are, George Washington Carver, for products from peanuts including cosmetics, dyes, paints, and gasoline, and Alexander Graham Bell, for the telephone. A couple that the students may enjoy are, Lonnie Johnson, who invented the super soaker squirt gun, and Gunpei Yokoi who was the creator of the Game Boy. Talk to the students about the ability to make something new and original and how these items have changed our world. I am just giving you a few examples for this article, but I would give the students many more. I make “piggy” banks from discarded 2-Liter Pepsi bottles (but I also make cow banks, kitty banks…). Show the students one of the handmade banks. If you can make something or have made something to show to the students as a model, then the lesson will have more value with the students. Show the students the materials that you have collected. In our study of trees, we have learned to recycle. We can also reuse old products in new ways to make a whole new invention. Tell the students that they will be graded on originality (they do not copy), effort (they do their best), and skill (they make something that can be used). 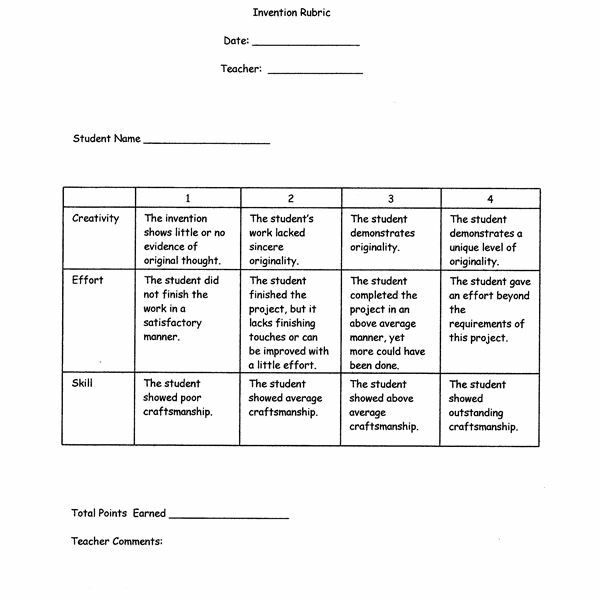 Show them the rubric below. Next, give the students some time to write or draw (to plan) their ideas and then share their ideas with one another or with you. A word of caution, if you allow young students to plan together, then you will likely get two or more of the same invention. You may decide to do the actual building the next day after the students have had some time to think more about their invention. Prior to the activity, split the materials evenly for groups of four. Pass out the materials. I did this lesson with a Kindergarten class to celebrate inventors. It compliments nicely to the social studies curriculum guidelines. Students enjoyed the freedom to create an invention and the product’s were absolutely amazing. For example, one student made a bird house with a feeder, one student made a boat for tub play, one student made a doll bed, one student made a paper clip holder for her dad, and one student made a McDonald’s for Barbie doll play (including a capital M on the top formed from pipe cleaner). Now, it is true that these are not actual inventions or else they would be original, but to the students they were one of a kind and to the teacher, they were all hand crafted, clever ideas from creative minds.